In June, in posts at the New Yorker website and here on this blog, I reported new statistics about the amount of time that the average American spends reading, as a way of updating my 2007 New Yorker article “Twilight of the Books,” which discussed America’s shift from a literate culture to one of secondary orality. A couple of days ago, to prepare for a radio interview on the topic, I decided to poke around online to see if I could update other statistics in my 2007 piece as well. Here are a few that were easy for me to find . . . According to the Department of Labor, American households spent an average of a hundred and sixty-three dollars on reading in 1995 and a hundred and twenty-six dollars in 2005. In 1982, 56.9 per cent of Americans had read a work of creative literature in the previous twelve months. The proportion fell to fifty-four percent in 1992, and to 46.7 per cent in 2002. 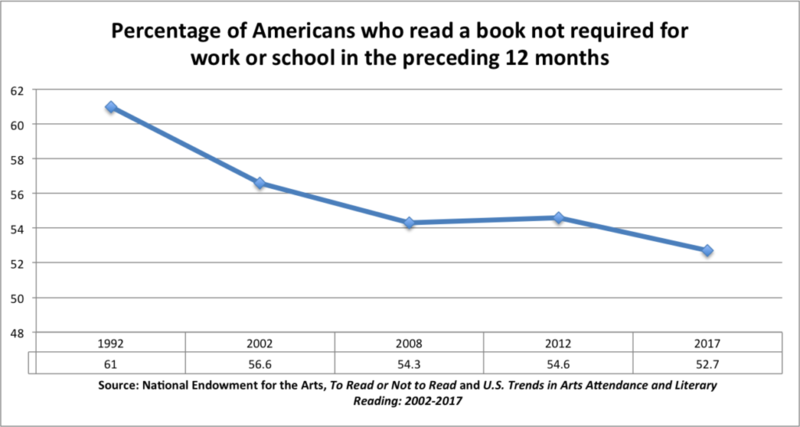 The NEA subsequently reported that in 2008, the share of Americans saying they had read a work of creative literature in the preceding twelve months recovered slightly, to 50 percent, but the share fell again in 2012 to 47 percent, and then in 2015 to 43 percent. In 2017, the number was hovering at 44 percent. What about non-fiction books, such as history, political punditry, and memoir? Over the past quarter century, the NEA has also regularly asked Americans whether they’ve read any book at all in the preceding year that wasn’t required for work or school, and it turns out that the decline here, too, has continued to be steady. It’s conceivable that the dip in household spending could be explained away by the price-cutting enforced by Amazon and by the internet’s decimation of the subscriber base of newspapers and magazines, but the recent declines in self-reported rates of reading look dismayingly consistent with the recent declines in average time spent reading. 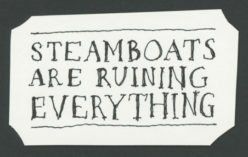 I’m afraid this is (still) a thing.